I concluded my productive trip to the University of Rochester yesterday, but not before I had a chat with Professor Damien Krysan. Damian has an interesting background, having worked at Abbott (medicinal chemistry), before doing an MD degree, which led to a faculty appointment at the University of Rochester. He is interested in antifungal agents and high-throughput screening, but this is not what crystallized my thoughts on the subject of today’s post. When Damian described his Abbott days, he reminded me of the early phases of using the AD (asymmetric dihydroxylation) process in industry. The development of the AD reaction was one of the truly exciting periods in the Sharpless lab and, although these developments predate my postdoctoral stay with Barry, I fondly remember some of the first-hand accounts of how the reaction evolved from the original pyridine effect defined by Criegee in the 1930’s (http://pubs.acs.org/doi/abs/10.1021/cr00032a009). The AD process acquired its rock-star status in the 1990’s, such that there was hardly an issue of JOC or JACS that did not contain an application of this technology in synthesis. The reaction was widely adopted in industry and, one might argue, ultimately defined many drug synthesis campaigns. This exemplifies a fascinating aspect of synthesis as it enables synergy between industrial needs and academic science. I want to make an argument that, in the ideal world, there must be a “perfect storm” of factors that lead to an explosion of interest in a particular synthetic process. Just think about it: what were the biochemical targets at the very top of pharma’s wish list at the beginning of 1990’s? Undoubtedly, many of them were HIV proteases. Logically, sp3-righ frameworks decorated with vicinal heteroatom arrangements can be seen in a ton of protease inhibitor structures. This helped to popularize the AD process as it opened a clear path to molecules of that type. You do not see comparable levels of utility of this reaction nowadays, do you? This is because pharma has moved on and targets of today differ substantially from those of yesterday. As a corollary to that, one of the best things a synthetic chemist might want to do is anticipate the upcoming biological targets. I do not think anyone does this sort of stuff, but I can see how the knowledge of relevant chemotypes that tend to hit promising biological targets can only help those who want to stay ahead of the curve and make their chemistry widely used. I think that metal-catalyzed amination of aryl halides is another great example. Here we have a reaction whose development coincided with an explosion of interest in kinase inhibitors. Having said that, there was no biological “foreshadowing” of the fundamental studies by Buchwald and Hartwig (and I am not saying that there should have been one – it all worked out perfectly anyways). Of course, an equally fascinating suggestion is that a simple-to-run process might influence the direction of drug discovery in industry. Indeed, synthetic chemists who work in pharmaceutical companies emerge from academia with unique preferences (there is a reason that Lipitor contains a pyrrole ring: Bruce Roth, the discoverer of this cholesterol-lowering agent, worked on pyrrole chemistry as part of his PhD). You might then say that it is a pity that reaction developers rarely care about biological relevance of their work and are not necessarily attuned to the latest trends of drug industry. However, perhaps none of this makes sense any longer because pnenotypic screens tend to drive industry as opposed to target-driven work. I don’t know. I have been absent for some time. Last Friday I gave a talk at Xerox in Mississauga and, ever since Sunday night, I have been at the University of Rochester as their Chambers Memorial Lecturer for 2015. This visit has given me an opportunity to learn about a ton of new chemistry and, thus far, my visit has been tremendously satisfying. Because I was asked to give three different lectures, I anticipated that this experience would be more intimidating than my typical visit to a school. At the end, I think I was able to find my groove and prepared three different talks. I have followed the work of Daniel Weix for some time and was keen to learn about his lab’s recent advance published in Nature. This paper is interesting for several reasons. First of all, it describes a solution to the problem of making unsymmetrical biaryls from two different electrophiles, which runs counter to the conventional way of joining a nucleophilic species (e.g. a boronate) and an electrophilic one (e.g. an aryl halide). The solution offered by the Weix lab has come in the form of a multimetallic system comprising nickel and palladium. While the idea might seem transparent on paper, the devil is in the details and the realization of unsymmetrical coupling has been elusive and took years to develop. Apart from some really interesting scope study (just look at compound 19), there are notable mechanistic lessons in this paper. In my view, the most important of them relates to confronting entropic factors (in other words, reducing the possible amount of products you might imagine here). It turns out that the palladium intermediate formed does not react with itself, is stable, and accumulates in solution. On the other hand, the nickel intermediate is “hot” and transient. It has capacity to react with itself or with the aforementioned palladium complex. Understanding the relative concentrations of these species in solution holds the key to attaining high selectivity of this reaction. When Daniel described this system to me, I was also left with the impression that potassium fluoride played a very important accelerating role in this imaginative catalytic process. Tonight I want to talk about reaction homologs. This is one of those enduring ideas in chemistry, representing what is consistently coming to the minds of those who are interested in developing new reactions. “Homologing” is when you have a process that gives a product that differs from its established predecessor by formal insertion of a one-carbon unit somewhere in the framework. For instance, in the case of a Diels-Alder reaction, a version that results in a seven-membered ring would be a homolog. Paul Wender did some really nice work in this regard, resorting to vinyl cyclopropanes in place of dienes. In the case of a pericyclic process, there is just no way that the homolog formation proceeds by the same mechanism as its “origin”. It just can’t happen. However, polar reactions are not that stringent and one-carbon “insertions” are often tolerated. The caveat is that those are almost obvious and not that interesting. I have always been attracted to interesting workaround solutions to homologing reactions that proceed via polar mechanisms. I do not see too many of them these days, but there are many examples that were developed in the past. Below is an example of a homo-Robinson annulation. The venerable Robinson annulation to make fused rings is the permanent fixture in advanced undergraduate classes, but what if you want to form a seven-membered ring instead? About a decade ago, Sam Danishefsky developed a really nice way to carry out this transformation. Below is the way it works. The reaction served Sam well in the synthesis of guanacastepene. Take a look at the molecule shown below. It looks innocent and fairly drug-like, wouldn’t you say? It is in fact perfectly soluble in buffers and does not contain any electrophilic “red flags”. But if you are equipped with a DLS (differential light scattering) instrument, you will discover the ugly truth that lurks behind the veneer of innocence here. It turns out that at 4 micromolar concentration, this molecule is a nasty aggregator, one that forms gigantic (well, relatively speaking) colloidal particles of 2312 nm in radius. Many small organic molecules form aggregates in aqueous solution, which has long had a rather perilous effect on drug discovery. Proteins you are trying to assay tend to stick to the surfaces of these particles rather well, which leads to nonspecific inhibition or, curiously, enzyme activation. This results in major aggravation and supplies a never-ending list of false positives in drug discovery. The behaviour of colloidal particles is so “outside the box” that they are often referred to as the fourth state of matter (besides liquid, gas, and solid). There are additives such as Triton-X100 one can use in order to disrupt aggregation, but Brian Shoichet and colleagues at UCSF recently developed something better – a computational method that uses lipophilicity and similarity to known aggregators to inform on the likelihood that a candidate compound is an aggregator. In my view, this is a very timely study (there are many previous papers on this subject from the Shoichet lab). If not a complete solution, this work reminds us that there are factors other than inherent structural properties of those nicely docked molecules on our computer screens that might be responsible for the effects we observe. I was thinking about this subject for a while, not the least because my mother suffers from Alzheimer’s. In this disease, aggregation of amyloid-β peptides is widely thought to play a key pathological role. It is clear that prevention of the amyloid-β plaque formation would prevent memory loss. This strategy represents a potential for therapeutic intervention through a disease-modifying mechanism. A question arises regarding the biochemical path to the formation of amyloid-β peptides. Several enzymes contribute to the build-up of plaques. 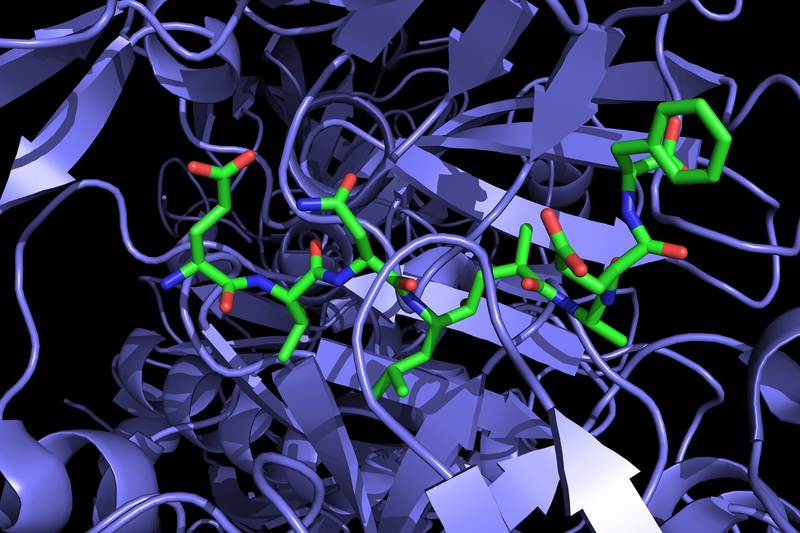 Of these enzymes, gamma- and beta-secretases have received a significant amount of attention from the research community. The enthusiasm in the early days of this research was grounded in the idea that inhibitors of gamma- and beta-secretases might block the production of amyloid-β plaques. Recently, however, gamma-secretase research has suffered a serious blow because a phase III clinical trial testing the inhibitor semagacestat failed (http://www.sciencedirect.com/science/article/pii/S009286741401304X). This led to closure of promising investigations aimed at inhibiting gamma-secretase and leaves behind beta-amino secretase as the best currently available target to prevent the formation of amyloid-β peptides. A seminal study by Stefansson et al. recently identified a missense mutation (A673T) in the amyloid-β precursor protein (APP) gene that protects against Alzheimer’s disease (http://www.nature.com/nature/journal/v488/n7409/full/nature11283.html). The mutation was identified by the analysis of the genome sequence data of 1795 Icelanders. I am truly amazed by the enabling features offered by the genetic makeup of this unique population. Interestingly, the A673T missense mutation reduces cleavage of APP by the beta-secretase BACE1. This finding supports the hypothesis that abnormal processing of APP causes Alzheimer’s disease. Significantly, the Stefansson paper further validates BACE1 as the legitimate target in search of treatment against Alzheimer’s disease. Apart from achieving blood-brain barrier penetration by BACE1 inhibitors, minimizing the inhibition of cathepsin D (CatD) is the obstacle that faces this research. CatD is an aspartyl protease with high sequence homology to BACE1 at the active site. It has been shown that the inhibition of CatD gives rise to toxic side effects. Once these two hurdles have been overcome, there will likely be a cure for the Alzheimer’s disease. Below, by the way, you can see a picture of the first report of BACE1 co-crystallized with a peptide inhibitor some 15 years ago (pdb id 1FKN). Over the past few days I was at the Vanderbilt University in Nashville, TN. Jeff Johnston (http://www.johnstonchemistry.org) put together a mini-symposium consisting of Professor Viresh Rawal of the University of Chicago (http://rawalgroup.uchicago.edu) and myself. Everything was sponsored by Sigma-Aldrich and I fully enjoyed this opportunity to visit the South and learn about what goes on at Vanderbilt as well as in Viresh’s lab. I learned a lot by hearing about the imaginative research programs led by Viresh and Jeff. Proton management turned into the common theme of the visit. One interesting piece of history I was not aware of was Margaret Etter’s work from 25 or so years ago. In it, the urea-driven activation of carbonyl compounds is described, which is foundational to many organocatalytic reactions. I think students should be aware of this work. Viresh’s talk reminded me about his remarkable discovery that TADDOL ligands are excellent catalysts for a range of asymmetric reactions. The activation here is derived from the enhanced acidity of the OH functionality that is augmented by the nearby OH in organic solvents. Over the years, Viresh’s lab has characterized several co-crystals formed between carbonyl compounds and TADDOL, which support the lowered pKa of the OH functionality. Last but not least, I want to mention one of Jeff’s cool recent uses of his chiral proton catalysts. In a JACS paper that appeared not long ago, he showed how carbon dioxide could be efficiently fixated using asymmetric catalysis. This is an exceptionally interesting article. Overall, this was a fun trip and I am very grateful to Jeff for putting the agenda together.